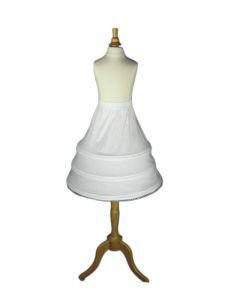 This is a beautiful flower girl 3-hoop cotton petticoat/crinoline. This flower girl 3-hoop crinoline slip is the perfect slip to add fullness under any special occasions dress, flower girl dress, pageant dress and communion dress. This crinoline slip features a wide elastic waistband for a snug fit. The hoops are made of a flexible light weight metal frame that can be adjusted to decrease or increase the fullness of the slip. The hoop skirt does not have layers of fabric and is ideal for girls that does not like fabric rubbing against their legs especially in hot climate. The lightweight framework is encased in a layer of fabric. The metals may be remove from the slip for machine washing purposes. Circumference: Bottom Hoop Circumference - 80"
Please refer to our reference guide below to determine which flower girl crinoline best fits your child. I bought this flower girl slip together with my A-line slip. They are just so perfect. The price, the fitting, the material, the shipping speed and customer service just so perfect. I highly recommended this site to any one still searching for their wedding related products!! !